At a very early age the sisters started to make music together, the band has now existed for more then 10 years. 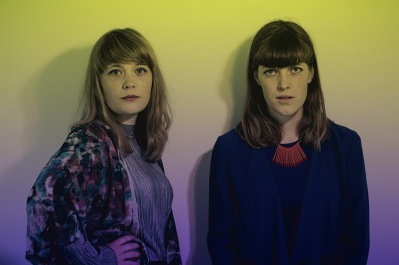 Both of the sisters work as freelance musicians and composers. Malin Almgren is a drummer/composer living in Gothenburg, she plays in a big variation of constellations such as: Larm, Henning, Det Brinner, Sisters of Jazz and Ljudgården. Karolina Almgren is a saxophonist/composer living in Malmö, she can be heard in projects like: Karolina Almgren Project, KAALM, Fanny Gunnarsson Quartet. Trough the years Sisters of Invention have worked and collaborated with numerous Swedish musicians, to mention a few: Nils Landgren, Rigmor Gustafsson, Ida Sand, Jonas Kullhammar and Jacob Karlzon. They have led various projects like Dubbelduon consisting of the sisters, Håkan Broström and Mai Leisz. Dubbelduon explores the concept of having two duos forming a band, playing with and against each other like two teams instead of reaching for the normal quartet sound. Another project is Sisters of Invention the Band, focusing on a more pop-like sound and reaching out too a slightly different kind of audience. As a contrast to the classic Sisters of Invention duo format, Sisters of Invention the Band consists of a couple of other fellow musicians with Malin and Karolina as a base. Sisters of Invention have played at a great number of big venues and festivals in Sweden and in Europe. They have recorded three CD:s under the label Oh Yeah Records, "Om & Om Igen”, ”Navigating”. In 2016 they won the prize Best group at Euro Radio Jazz Competition in Amsterdam, and 2017 "group of the year" by SR (Swedish Radio) P2:s Jazzkatten.